JobTestPrep's resources can help you prepare for Concorde Career College's admissions and enrollment process. Our materials include practice tests, sample questions and drills, answer explanations, study guides, tips, and more. Start preparing today to ensure your success. 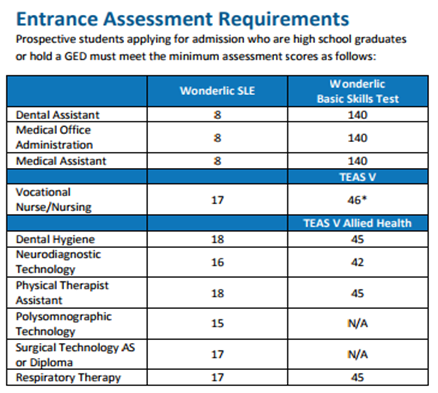 The Wonderlic SLE, also known as the SLE, measures how quickly and thoroughly students understand instructions, learn and comprehend new material, and cope with the complexity of school. Furthermore, the SLE is used to determine which programs and job opportunities best suit a student’s aptitude, and to identify students who need additional help with classroom work prior to the start of their first class. The SLE consists of 50 questions which are to be answered within the 12-minute time limit. Additionally, for some programs, Concorde Career College also utilizes the Wonderlic Basic Skills Test (WBST), which is an exam measuring basic math and verbal skills. Both the math and verbal tests are 20 minutes in length and are mainly used to highlight your work readiness. Prepare for the Wonderlic SLE and Wonderlic BST with JobTestPrep’s Wonderlic preparation packs. Our PrepPacks contains practice tests, dozens of sample questions, answer explanations (to help you thoroughly understand the material), score reports, and test-taking tips. Prepare today to ace the exams! Prepare for these steps with JobTestPrep’s preparation packs. Our PrepPacks™ are thorough and prepare you for each step of the Concorde admissions process. Concorde Career College, established in 1966, has 16 campuses across the United States (California, Colorado, Florida, Mississippi, Missouri, Oregon, Tennessee, and Texas). Concorde Career College, formerly known as Pacific College of Medical and Dental Careers, has collectively over 18 different degrees and programs. Furthermore, the college has 12 different partners, some of which include well-known companies like CVS, Kaiser, and First Transit. On average, students will encounter a tuition cost of $15,000.